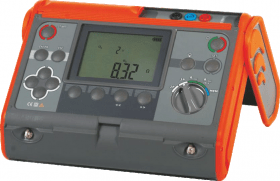 The AMRU-21 earthing resistance meter allows us to perform resistance measurements by the 2p method, grounding measurements by the 3p technical method and continuity measurements of the equipotential and protective connections with a current of 200mA , with automatic zeroing function (complying with EN 61557-4). In addition, other measurements can be carried out, such as measuring the interference voltages or measuring the resistance of the auxiliary electrodes RS and RH. The equipment has double electrical insulation, following EN 55761 and IEC 61557. The measuring category is CAT IV 300V according to EN 61010-1, and the degree of protection of the housing is Ip54 according to EN 60529. Resistance measurements by the 2p method. Earth resistance measurement using auxiliary probes with 3-pole method, measurements with max. resistance of auxiliary probes 50kΩ. Continuity measurements of the protection and equipotential connections (complies the requirements og IEC 60364-6) with I=200 mA and auto-zero function. Measurement of the resistance of the RS and RH auxiliary electrodes. Measurement of disturbing voltages in the network. Carrying case, harness and batteries.